“Ultimate fun motor biking tour plain to high land"
Upper Mustang is supposed to be the most fascinating land to motor cycling tour in the world. The motor biking tour crosses plain to high land (China autonomous country). It is only one good idea to explore of Upper Mustang within short time with lot fun adventure. Mustang offers a dry landscape; therefore, it's well-known as ‘rain shadow valley’. It has fewer trees barren landscape, the hill is formed by sandstone with brown and pink color. Likewise, Lo – Manthang, Tsarng, and Ghami are the main villages of this valley. These villages were found before the 15 century and are best for side trips. In the same way, there are many monasteries built here before the 12th century like Logheghar or Ghara gompa, and line of colorful mani walls. Motor Cycling tour to the Upper Mustang is one of the best ways to witness the spectacular beauty of this region. You will drive from Kathmandu to Pokhara through the bus, and begin your motor biking towards the Upper Mustang. Another alternative is to take a scenic flight from Kathmandu to Pokhara and then to Jomsom. This will save your time and energy, and offer you the gorgeous view of this region from the sky. Trek starts from Kali Gandaki sandy bar valley along with the views of Annapurna Ranges. You will reach Kagbeni, where you will see a police check post office. You have to register your permit and exit here. From here, the trail continues following Kaligandaki River along the newly constructed motor road through Tsaile, Samar, Syangboche, Ghani, Dhakmar, and Tsarang. On the way, you will see awesome views of, Dhaulagiri 8,167 meters (26,794ft) and Annapurna I [8,091 meters/26,545ft], and many other mountains below 8,000 meters (26,246ft). Day 01: Arrive in Kathmandu [1,315 meters/4,314ft], overnight in Hotel. Day 02: City sightseeing in Kathmandu by motorbike. Day 03: Kathmandu to Pokhara [820m/2,690ft];2,00km, 6-7 hours by bus. Day 04: Pokhara to Kalopani [2,530 meters/7,841ft],125km; 6-7 hours. Day 05: Kalopani to Muktinath and back to Kagbeni [2,890m/9,480ft]; 65km, 6hrs. Day 06: Kagbeni to Ghami [3,510 meters/11,515ft], 6-7 hours. Day 07: Ghami to Lo Manthang [3,840 metrs/12,598], 5-6 hours. Day 08: Explore at Lo Manthang by trekking. Day 09: Lo Manthang to Kora la (Tibetan border) back to Lomanthang. Day 10: Lo Manthang to Syangbuche 4-5 hours. Day 11: Syangbuche to Jomsom 5-6 hours. Day 12: Jomsom to Tatopani (Natural hot spring) 5-6 hours. Day 13: Tatopani to Pokhara 6-7 hours. Day 14: Pokhara to Kathmandu 6-7 hours. Day 15: Departure to Home. Welcome to the land of white glowing mountains. Before your landing in Kathmandu Tribhuvan International Airport, the representative from Himalaya Diamond Adventure will have reached there to welcome you. After landing your aircraft, we come to pick you up with our welcome greetings. Collecting your luggage, we drop you off to Hotel. You will have welcome dinner in Nepali cultural dance restaurant with your guide’s briefing about the day program tomorrow. The hotel service includes bed and breakfast. After breakfast, Your motorbike tourguide will pick up from the hotel for 3 major UNSESCO heritage sites of Kathmandu valley Pashupatinath temple, Bauddhanath stupa and Kathmandu durbar squire then back to hotel for final tour preparation of upper mustang motorbike tour as well as double check the equipment you may have or require to rental. After breakfast, we ride to Pokhara. It takes 6-7 hours on motorbike. The road is completely a busy highway and offers beautiful countryside views, River and waterfall. Pokhara is natural city of Nepal and laps of Annapurna range can be seen from your hotel overnight in hotel. After breakfast our motorbiking tour starts from Pokhora to Kalopani, first road level is paved road till Beni 104 kilometer and takes about 3 hours. Rough road begins after Beni. Riding road is bank of Kali Gandaki River and huge waterfalls. Reach at Tatopani for lunch break then continue ride to Kalopani. From Kalopani, we can see one of the excellent views of Mt. Dhaulagiri, Annapurna I, Tukuche peak and Annapurna Himalayan range. After breakfast then bike ride through rough road through Kali Gandaki River is with scenic Himalayan range of Annapurna, Nilgiri and Dhaulagiri. Reach at Muktinath [3,800 meters/12,467ft], where you can visit holy site Muktinath temple and Buddhist monastery. Ride back down to Kagbeni for overnight. Kagbeni have interesting place to visit that may suite for your evening walking overnight in guesthouse. After as usual breakfast we set out ride to Upper Mustang area after crossing permit checking point at the end of Kagbeni village. Almost of riding road is via bank of Kali Gandaki River, and typical settlement of local peoples. Pass [3,800 meters/12,467ft], altitude village and Nya La pass of [4,010 meters/13,156]. Reach at Ghami and overnight in local tea house. Today we are quite exited to reach ultimate destination of this tour, Lo-Manthang. We cross several Mani walls and beautiful Tibetan people inhabited Charang village. Panoramic Mountain view is always seen as different angel. You will than view wall covered village from far. It is better to take rest once you reach at tea house, which help your body to acclimatization. Today explore around Lo manthang on foot, such Namgyal gumpa, which is situated at the top of the hill. Our tour continues to Tingkhar village. Tingkhar village is the last village and main village of Lo Manthang. If time permits visit another attraction of four stories of King Palace with panoramic Himalayan view surroundings. Ride to China border Kora La. It is about 20 kilometers one way from Lomanthang. Get the stunning view of Himalayas and valley return back again to Lo - mantang for overnight. Ride back same way to Syangbuche. The same view of plateau land and panoramic Himalayas during whole day overnight in lodge. Continue ride to Jomsom. If you still get time, you can have walking tour around the village, monasteries overnight in lodge. Ride back to Tatopani visa Jomsom, Marpha and other typical villages. Enjoy bathing at natural Hot Spring overnight in guesthouse. It is same way wonderful views, ride back to Pokhara. Enough time to walking around Lake side after check in Hotel. Today is our last day of upper mustang motorbike trip about 6 to7 hours ride back to Kathmandu overnight in hotel. After a wonderful mountain biking tour, we drop you in Kathmandu Tribhuvan International Airport at terminal room by private vehicle in your flight departure time and say goodbye. Three nights Hotel in Pokhora sharing room with breakfast service. Transportations: It will be as mentioned on the tentative itinerary. Three meals during the trek on your choice (Breakfast, Lunch, Dinner & Dessert with hot drinks coffee or tea). Jeep service keep our baggage, extra spare parts, and Mountain bike for whole trip. Your personal expenses like; hot shower, laundry, battery charging, telephone, and shopping. The best way to witness the spectacular beauty of Upper Mustang through Motor Cycling tour. 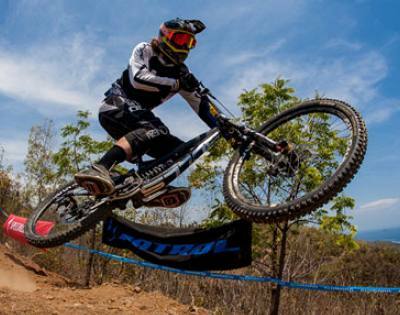 Ride a mountain bike with sport and experienced Motor Cycling tour guide with company's comprehensive service. We provide you tourist standard hotel in Kathmandu for 3 nights with breakfast service. Before leaving Himalaya for Motor Cycling tour, we organize valley sightseeing tour like world heritage sites. We will have from Kathmandu a scenic bus journey to Pokhora 200 kilometers, 6 to 7 hours by tourist bus, and next day we will fly to Jomsom [2,743 meters/8,999ft], through Annapurna Himalayan range and Dhaulagiri to reach Motor Cycling tour starting point. We will ride through the bulking Buddhist faith people settled lands following up Kali Gandaki River with backdrop superb Nilgiri, Tilico, Annapurna, and Dhaulagiri Mount View. We will ride most of the time along the newly constructed road, not yet to reach boder of China. During the Motor Cyclinng tour we will explore beautiful Buddhist cultivated lands, Lo-manthang walled city, Niphu - Garphu, Thinger, Tsarang, Dakmar, Mani walls, Gompa (Monasteries), Prayer walls, Stupas, fluttering prayer flags and Mustang old Darbar square. It needs 19 days of holiday, good level of physical fitness and moderate Motor Cycling skilled party to make a pleasant and successful Motor Cycling tour. During the Himalaya Cycling tour we stay in lodges with company's comprehensive service. If you do not have own Motor Cycle; we provide you Motor Cycles on hire at it reasonable price as well as extra spares too. We will make Pokhora tour also on Cycle. It will be a lifetime riding experience. You do not have own motor bike and helmet then we provide you, the cost is extra for you. We provide you (-20*C) down sleeping bag and (-12*C) down jacket (Pay extra 1USD each day for one item).